On this post we will summarize all the sales related to the Indian Independence Day. 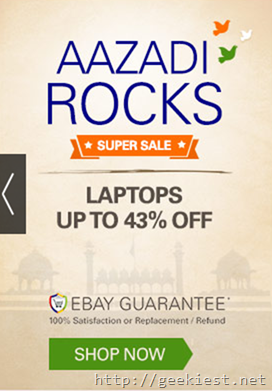 We expect Amazon, Flipkart and eBay will have some special discounts for the coming Independence day celebration. Amazon already announced the The great Indian Freedom Sale from 10th of August to 12th of August. The offers include 15% additional cash back on Amazon mobile App and 10% additional cash back on website etc. Below you can see the benefits if you install the Amazon App. Offers worth over INR 5800. You can also win a golden pass (first 5000 participants will win golden pass every day). If you are an existing app user you can also participate to get a golden pass, just login on you app and subscribe. You may win Amazon gift cards, OnePlus 2 invitation, Nook my show voucher etc. Download the Amazon.in mobile application ("Amazon.in App"); (If you have already installed the app, you will still be eligible. You do not have to reinstall the app again); and 2. Sign-in to your Amazon.in account OR sign-up for an Amazon.in account through the Amazon.in App; and 3. Nominate yourself for the Promotion by filing in your Amazon.in account details on the "Nomination Page for the Golden Pass" and clicking on the 'Subscribe' link available on the Amazon.in site and/ or the Amazon.in App. Flipkart Freedom sale starts on 7th and 8th of August, once again it is also on the mobile application. So if you can use Mobile application to buy things we prefer you to install the Amazon or Flipkart applications and save more money that buying it from the website. You can get INR 2000 off on Asus Zenfone 2 if you are ordering it through Flipkart mobile application. So save INR 200 using the mobile app. I just ordered Asus ZenFone 2 64 GB, 4GB RAM for INR 20,999. We will update this post as soon as we get information about more Freedom sales on Flipkart, eBay or other online stores. 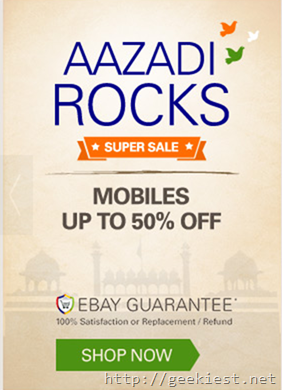 Ebay offers special discounts to celebrate Indian Independence day. You can get up to 43% off on Laptops,up to 34% off on cameras and up to 50% off on mobiles.